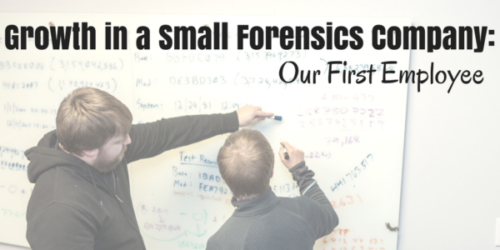 Growth in a Small Forensics Company – Our First Employee - DME Forensics Inc. Okay, it’s been a while since we shared a post about the history of DME Forensics. If you haven’t already, I’d recommend checking out the prior posts in this series to get caught up. After we made the decision to turn our library of DVR recovery scripts into a fully functioning product, we began to plan the path forward. We debated the pros and cons of hiring someone to help us grow. While bringing on an employee provides additional ideas and resources, it is also a significant expense for a very small company. It can also be hard to find good talent at such an early stage of a company – it is generally risky for an employee to leave a stable position to join a start-up. Fortunately, I had a specific candidate in mind. I had worked with him on development projects in a prior position, and he had expressed interest in starting something new. Looking back, over the years of working together I have realized he is actually quite risk-averse, but he took a big risk in leaving a comfy corporate position to join us. We both had strong faith in DVR Examiner and the company we would be building. Our first employee joined the company in January of 2014. Up until this point, I had been working out of a spare bedroom in my apartment. Due to the complexity of the development and reverse engineering process, we both wanted to work side-by-side in the same room, as opposed to working remotely. As such, we leased our first small office in Manassas Park, VA that year. The first several months in the new office were spent working together on the reverse engineering process (this new employee had never looked at a hard drive at a binary level before). We then moved on to transforming my proof-of-concept into what would eventually become DVR Examiner 1.0. Despite his lack of experience in low-level recovery, he picked it up quickly and was soon reverse engineering his own filesystems for inclusion into DVR Examiner. He still works with us today – and many of you may already have talked with him or seen him at conferences. While he isn’t reverse engineering DVRs on a daily basis anymore, he has taken over many of the day-to-day functions of our company. Tyler Schlecht, our first employee, became our Chief Operations Officer. Now if that isn’t growth in a small company, I don’t know what is! Next time in “Growth in a Small Forensics Company” I’ll continue this story with the release of DVR Examiner 1.0 – our first mass market release – and what changes that brought to the company.